Location and breakfast. Management’s attitude once we provided our feedback. It’s located right on the Old Town square. You step out your door and you can start visiting tons of historical buildings and sites. The location is really nice , delicious breakfast and professional staff . I absolutely recommend it to this apartment . Dziękuje bardzo ! Location was excellent, staff were very helpful, we were able to text queries or requests which was useful because not all staff spoke English. Yes very simple check in process! Comfortable and quiet rooms. Friendly staff. Great location! Amazing location and breakfast was brought up to the room. The staff was amazingly pleasant - all smiles. Great restaurant below as well as a bar. Bars and restaurants a stone throw away in all directions. Perfect location right on the main square. Delicious breakfast pre-ordered and delivered at a time of your choice to the apartment. Keyless entry system to main door and apartment door is a great idea (as long as you can remember the codes lol). Contact with the managment was good, there wasn't any problem to communicate and sort things out. Breakfast is served straight to your apartment. Hundreds years old fundaments with modern designs and facilities are well connected. The apartment is in a perfect location just in the middle of old town district city of Toruń. Thanks to that it's close to everything what city can offer to you. Downstairs there's a restaurant and lover kind of nightclub. Lock in a great price for Apartamenty Toruń Rynek Staromiejski – rated 9 by recent guests! 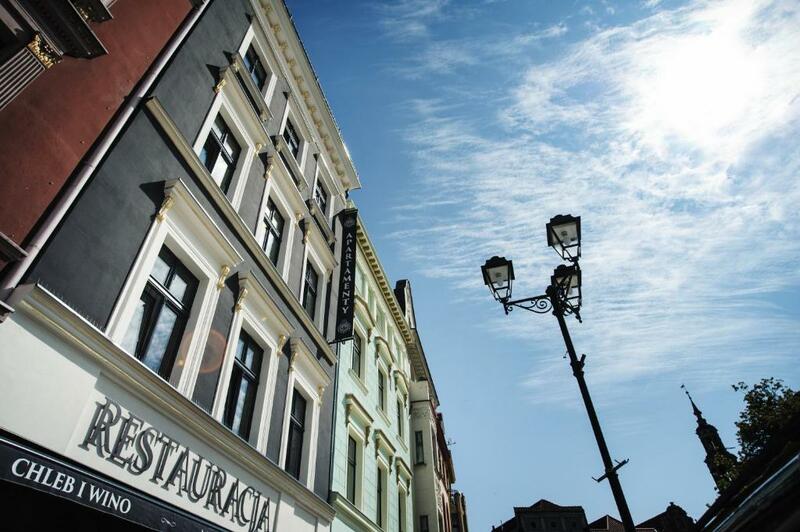 One of our top picks in Toruń.Apartamenty Toruń Rynek Staromiejski offers stylish and modern apartments, located in a 16th-century building in Toruń’s Old Town. 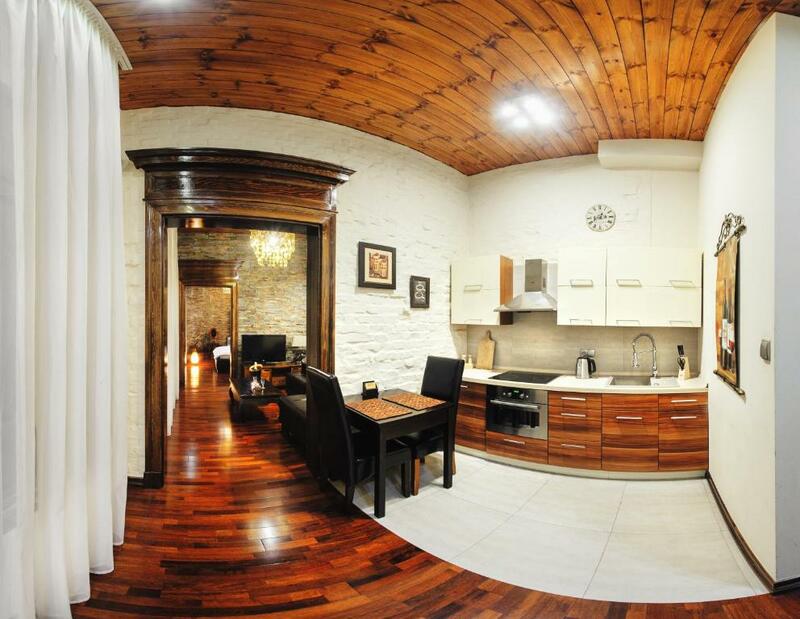 All feature a fully equipped kitchenette with a dining area and free Wi-Fi. 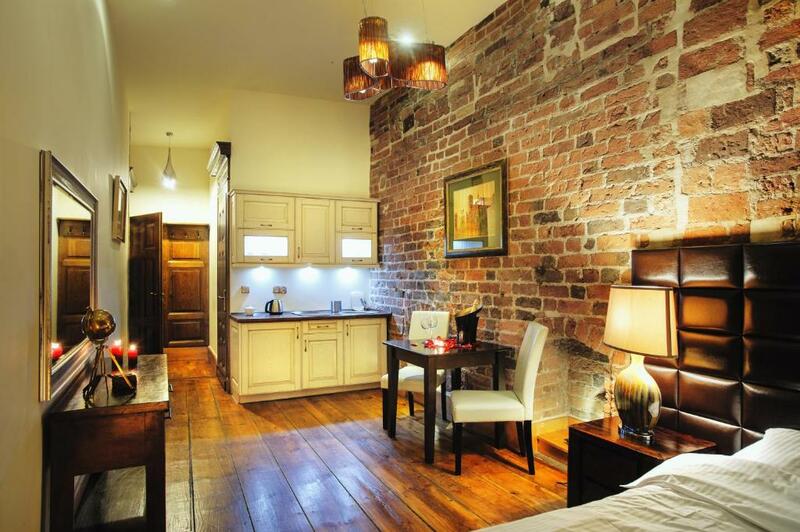 The apartments at Apartamenty Toruń have a flat-screen TV with satellite channels. Their interiors are modern and finished with wood. Guests are welcome to use luggage storage and laundry services. Airport shuttle is available at an extra cost. Apartamenty Toruń Rynek Staromiejski is located in the heart of the Toruń Main Market Square, 1.2 mi from the Toruń Główny Railway Station. The Vistula River is just 1,650 feet away. 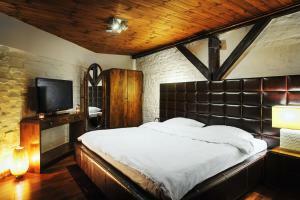 뀐 Located in the top-rated area in Toruń, this property has an excellent location score of 9.7! When would you like to stay at Apartamenty Toruń Rynek Staromiejski? 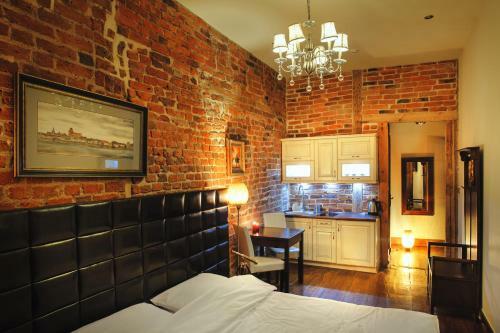 Apartment consisting of a bedroom, a kitchenette and a bathroom with a bath or a shower. An air-conditioned apartment with cable TV and a kitchenette. Apartamenty mieszczą się w zabytkowej kamienicy przy ul. Rynek Staromiejski 22. Nasze Apartamenty to starannie zaaranżowane wnętrza, harmonijnie łączące styl Art déco z nowoczesnym wyposażeniem. Każdy Apartament posiada własną łazienkę, aneks kuchenny z jadalnią, oraz urządzoną w eleganckim stylu sypialnię. Do dyspozycji gości mamy 15 luksusowych Apartamentów. Każdy z nich posiada: łoże king size aneks kuchenny łazienkę z prysznicem lub wanną Wi-Fi TV-SAT Położenie, standard i komfort oferowanych przez nas Apartamentów tworzą wymarzone miejsce pobytu zarówno dla turystów, gości biznesowych jak i rodzin z dziećmi. 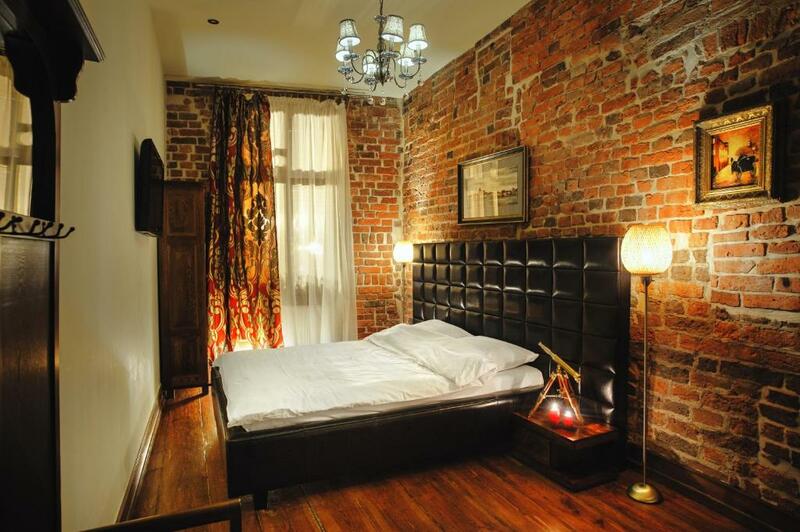 House Rules Apartamenty Toruń Rynek Staromiejski takes special requests – add in the next step! Apartamenty Toruń Rynek Staromiejski accepts these cards and reserves the right to temporarily hold an amount prior to arrival. Please note that hot tub is available from April to September. Please contact the property at least one hour prior arrival in order to arrange a check-in. Please note that the apartments have no elevator. Please note that it is not possible to drive directly to the apartment building. Please inform Apartamenty Toruń Rynek Staromiejski of your expected arrival time in advance. You can use the Special Requests box when booking, or contact the property directly using the contact details in your confirmation. We changed apartment as the first one was very noisy, it was right beside the restaurant with music playing from early in the morning to late at night. The second apartment was great but up lots of very steep steps, not good for people lacking mobility. We had a 4th floor apartment as well as a fifth floor apartment. The wifi on the fifth floor was non existent. Need to add routers on each floor. Stairs can be a bit slippery and steep - however this is a historical part of town and not sure what they are at liberty to use instead of tile. Hotel the railing and no issue. A bit noisy as right on the square but we bought ear plugs and all was good. Unfortunately our apartment was right over the front door and it slams shut at all hours. We were also right over the restaurant which was open until midnight and the door between the hall and the restaurant needs a damper as it also bangs shut constantly, but as mentioned ear plugs did the job for us. Once in the morning apartment ran out of hot water, but anyway it wasn't a big problem which could change our mind about this place. Nothing! This was one of our favorite properties from our two week trip! The place was beautiful and in a perfect location! It was also very nice to be able to order breakfast to be delivered to the room in the morning. Only small inconveniences. There are no critical flaws in the room and service. Very nice room. Very convenient settlement, very friendly administration. The location is super, the front door to the central square. Very quiet room. Recommend. Gorgeous city. The staff were very accommodating despite us altering dates a couple of times, they catered to our needs perfectly. Issue with booking, had to call several times to actually get the code which should have been send by message/email. Stairs which lead to apartments should have more lights for sure. You can hurt yourself if you won't pay enough attention. Restaurant is amazing we really loved it! Very noisy. I recommend this place to young people who like to party....the noise from downstairs clubs and outside guest wasn't as bas as young and very drunk people coming back from parties, yelling and screaming at 2-3am. Rooms need renovation. The numerous stairs to our room that weren’t clearly advertised before hand. Room was very hot and partially unusable due to very low ceilings (it was in the attic). Lack of natural light.